Coins & Currency of Wayne is a coin dealer in Wayne, Pennsylvania, that buys and sells common and rare collectible coins of all types. Just some of the coins that this Philadelphia-area coin dealer handles includes 18th- and 19th-century type coins, Indian Head and Lincoln wheat cents, Buffalo and Jefferson nickels, Mercury and Roosevelt dimes, Standing Liberty quarters, Walking Liberty and Franklin half dollars, Morgan and Peace silver dollars, Barber coinage, 19th-century type coins, certified rare coins, pre-1933 U.S. gold coins, pre-1965 U.S. 90 percent silver junk coins, traditional commemorative half dollars, modern coins, and many other types of coins. Customers can be confident that they will receive outstanding service from the team of knowledgeable associates who operate Coins & Currency of Wayne. 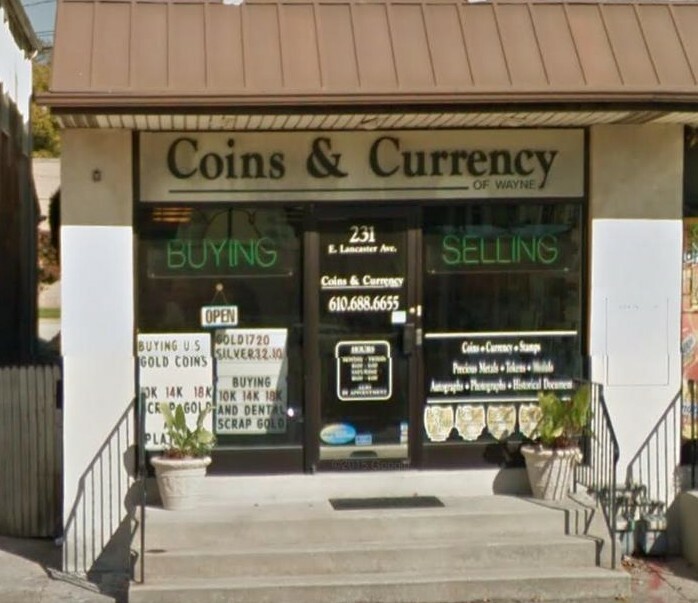 This coin shop is an authorized dealer for the Professional Coin Grading Service and Numismatic Guaranty Corporation, and the owner is a member of the American Numismatic Association, Wayne Business Association, and Main Line Chamber of Commerce.